From the opening frames of the credits, the church hymn, the Rorschach prints and the measured and precise pacing of them, we are entering a world of a severely disengaged man, who has had the spectre of schizophrenia as his constant companion, both in his waking and sleeping hours. The mumblings and rememberances of Dennis Clegg (Ralph Fiennes)combine to make for a journey down Memory Lane that is unlike any that rational, thinking people would care to take, let alone inhabit and from which there is very little chance of escape. 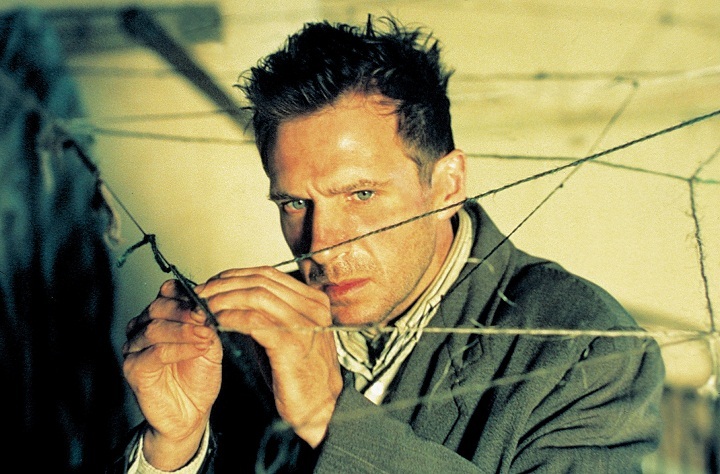 Fiennes spends the length of the film attempting to piece together bits and pieces of times past in his childhood, that may or may not have happened. The prize in this herculanean effort is not so much to discover the unseemly goings on of his father, but rather seeking a discourse into the inner workings of Clegg's mind and what it potentially holds and abandons at will. Dennis Clegg has been released into the care of a matron (Lynn Regrave) in a halfway house in a decaying, dying section of London, that has become the home, heart and soul for others of his ilk; the mentally disabled, discharged from the asylum, but not quite ready for habitation in the outside world at large. His lodgings represent the underbelly of a netherworld that caters to no one and where rehabilitation is a foreign word,absent from the vocabulary of those in charge. Redgrave plays Mrs. Wilkinson, the spawn of Nurse Ratchet, with a demeanor as cold as the grave and as uncaring as any you are likely to see. Hers is a job, nothing more, nothing less; an automaton in the flesh. John Neville (teamed again with Fiennes. He was in "Sunshine.") as Terrance,another resident of the house, has etched a character who sums up the medicated and serene patient seen as a non-threat to the establishment, but who attempts to warn Clegg of the "queenly" attitudes of Wilkinson and the powers she holds. This British character actor's small part in this film is a gem deserving of recognition. Every movement that Clegg makes is guaranteed to bear witness to a recollection and to focus on events as perceived in his ever crumbling mind. Once his journey into neverland begins, we are brought along ever so slowly so that we capture these moments precisely and without seeing error. We learn that his mother, as played by Miranda Richardson, had nicknamed him "Spider" and it is through his newly gained name that his mannerisms take on the skin of the animal. Each newly remembered facet of his world is honed on the impressions of a spider web -- the string, broken glass, the jigsaw puzzle, the string game he plays at the kitchen table -- spiraling and spinning the child and the man into its deadly web and further from reality as we know it. Richardson portrays three multi-faceted characters in this film, three spirits, and with each one she sheds a skin and grows another, entirely different in bearing and manner. It is a tour de force performance. Gabriel Bryne as Bill Clegg is dark and daunting, shown as a family man bored and tired with the mundance existance that is his life. Or is he? The performance of Bradley Hall as the young Spider is eerie and precisely on the money. You can feel a kindred spirit between his child Spider and the adult that he is to become in Ralph Fiennes. The best has been saved for last and that honour belongs to Ralph Fiennes. His Spider is haunted and haunting, gritty and realistic. This crumbling vestige of a man has been finely honed and not once did I think that I was watching a "performance" but rather as true a representation of a schizophrenic as one is able to command. It is not a glamour role or a safe role, not a trace of "pretty boy" about it and thank god, none attempting to project itself from the proceedings! Fiennes, who is known for the research he puts into his roles, has scored all aces with this one. Another added plus is that Hollywood has not managed to ruin a good thing -- a film that truly makes one THINK about what they have just seen. I cannot help but put another role as a schizophrenic into play -- that of Russell Crowe in "A Beautiful Mind." When you see these two films and attempt to add the similarities, about the only one that comes to mind IS the fact that schizophrenics are being represented and nothing more. Fiennes has left, for all intents and purposes, Crowe's portrayal in the dust, and if Hollywood has any guts come Oscar nomination time, they will credit a true acting triumph, rather than the orchestrated ones that usually win because of huge studio mounted pushes. "Spider" is the little film that could, did and should. "Spider" is not an easy film to watch, but then seeing madness never is. There are those who will be turned off by it, or perhaps momentarily subjected to moments of quiet. Then again, others will cheer a peformance that is worthy of the accolade, "a job very well done indeed! BRAVO!" Cronenberg, as director, has launched a film that is as subdued and unassuming as a breath of air as it brushes past a cheek. The hollow streets, the absence of crowds and the delicate renderings of cast and crew alike, have conveyed a dream or as some would insist, a nightmare and forsaken a Hollywood beginning, middle and end. I sincerely hope that "Spider" is not lost in the shuffle of films that will spill forth over the course of the spring, or be considered as "too arthouse" to warrant consideration by other than those who know absolute talent when it is put in front of them. This film is not "entertainment" per se, and that would be the wrong word to use. Rather, eye opening and thought provoking would be a more apt description. It's a step on the edge of the abyss and the eventual and catastrophic conclusion that must become Spider's reality. It is minimalist and daring and I can't say strongly enough how much this ensemble cast has brought forth for our inspection. See this film and be amazed at it in all its consummate glory!